Of all God’s creatures, perhaps the most maligned and most misunderstood is the author. It’s easy to see why, really—for all the amazing literary transubstantiation that transforms caffeinated beverages into words, they still have the tendency to wander aimlessly, ramble about imaginary people, and go for long stretches without showering or changing out of yoga pants. You may find them sobbing over their keyboards for no apparent reason or giggling manically to themselves with their fingers flying over their laptop keys. Never fear, however; this behavior is normal and what authors like to call Part of Their Process. If you have one within your care, you may want to refer to this handy field guide on how to properly care for and feed your author. 1. Feed your author a well-balanced diet. Authors may say they can subsist on a steady diet of black coffee and Twizzlers, but this is indeed not the ideal diet for one who lives a mostly sedentary lifestyle. Long hours in front of the computer, frantically typing words beneath a looming deadline, tend to make authors forget about normal things like meal planning and cooking. If you live in a house with an author on deadline, the kindest thing you can do is help plan well-balanced meals that do not involve talking into a speaker or paying a delivery man. It has been scientifically demonstrated that a clean diet filled with fresh fruits and vegetables increases both productivity and creativity. For difficult cases, we recommend tossing sliced fruit and bags of baby carrots toward the author’s desk and then backing away slowly. 2. Take your author for frequent walks. Because authors live in their own minds for long stretches of time, they have the tendency to forget about the outside world. Yet plenty of research has demonstrated that productivity and focus decrease the longer we spend on a task, and people who take hourly breaks (yes, even to watch funny cat videos on YouTube) are more productive than those who don’t. Additionally breaks taken outside have even greater benefit: a walk around the block can make your author more creative, more focused, and more productive when they return. 3. Encourage your author to play regularly. It is easy for your author to get so fixated on the deadline ahead of them that they only make time for their obligations and their work, leaving recreation on the back burner. 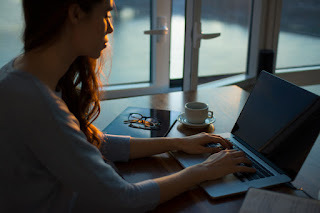 However, long-term play deprivation has the same effect as sleep deprivation—it can make people cranky, less creative, and more stressed out, none of which are conducive to writing their best work. Whether it’s playing the guitar, putting together Legos with a child, or doing a crossword puzzle, play unrelated to work is vital to your author’s wellbeing. 4. Expose your author to many different inspirational art forms. Many authors will limit themselves to reading in their genre for inspiration, which is leaving out an entire world of artistic endeavors to explore. All arts have one thing in common: they’re meant to give the watcher/reader/listener a different view on the world and to make them feel. For writers, that means inspiration can be found across genres and disciplines: dance, music, art, theater. Take your author to a concert, to a play, to the ballet . . . and watch the creativity flow. 5. Give your author frequent praise, while blocking access to their Amazon rankings and Goodreads reviews. Authors are strange creatures who rarely believe the praise of strangers but take their criticism directly to heart. If you love an author, the best thing you can do is to remind them how proud you are of them, while limiting their access to the worst of the online criticism. They need to be reminded that they’re more than their ability to write stories and that they’re important no matter how successful (or not) their writing is. The more they can focus on the close relationships in their real life, the more able they will be to brush off the criticism of strangers . . . and the better equipped they will be to make more art. Of course, there are times when all the above will fail, and it’s important to remember that at heart, authors are still wild creatures. If you find yourself in a situation where none of the above are possible, I suggest that you throw good-quality chocolate . . . and run. What are your self-care must-haves to keep yourself happy and productive? Tell me in the comments below. 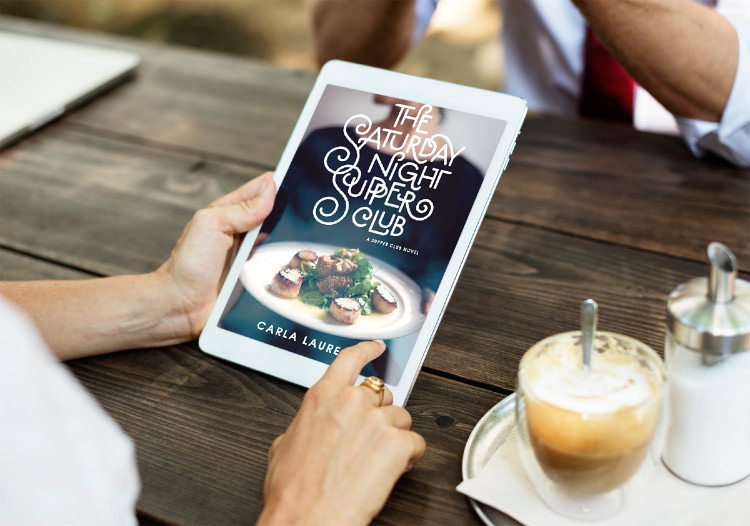 One commenter will win a copy of my upcoming novel The Saturday Night Supper Club, releasing February 6, 2018! Or preorder your own copy here. 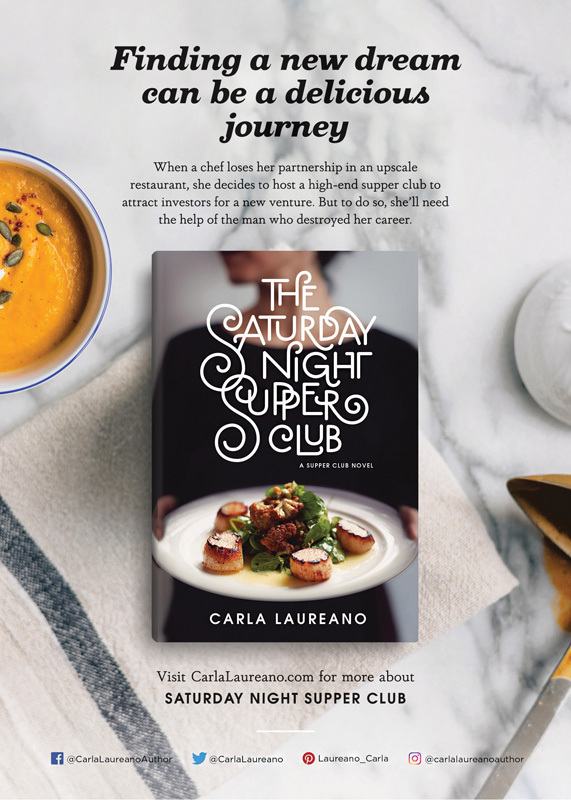 Carla Laureano is the RITA® Award–winning author of contemporary inspirational romance and Celtic fantasy (as C. E. Laureano). 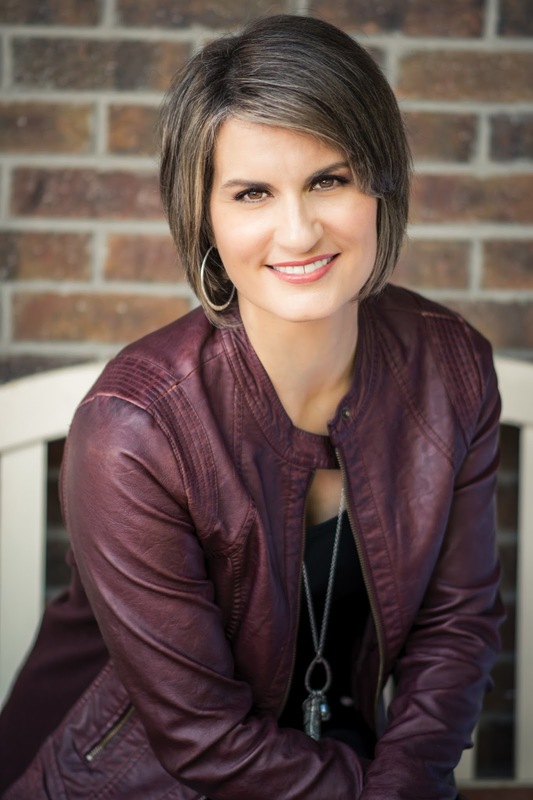 A graduate of Pepperdine University, she worked as a sales and marketing executive for nearly a decade before leaving corporate life behind to write fiction full-time. She currently lives in Denver with her husband and two sons, where she writes during the day and cooks things at night. Sign up for her newsletter at www.CarlaLaureano.com to get a free e-book romance novella. Oh Carla! I love this post! You inspired me to make a quick run to Seekerville Market for Twizzlers and chocolates and of course, I brought enough for everyone! I'll leave the coffee brewing to the experts but help yourselves to the snacks! Meanwhile I need to implement some of these tips for a book blogger I know. Thanks so much for joining us today! I'm reading SNSC this weekend! Yay! Beth Erin, I borrowed all the Keurigs in Seekerville and lined them up on the sideboard. I see regular, dark roast, Hazelnut, Caramel Vanilla (my fav!) and blueberry... goodness, there's just too many to name. Chocolate and 50 gazillion flavors of tea as well. I think I saw scones as well. We are on for the day! Whoot! Thanks for bringing the coffee for us caffeine-obsessed people! I haven't really thought about any self-care must haves in my own life. Being a homebody and liking my solitude (I'm not a writer), I do sometimes like to go for a short drive to get out of the house. Or plan a grocery shopping trip to change my environment. Honestly, being a homebody and enjoying my own company, it's really hard for me to want to go out...lol! My husband is good about getting me to do things though. We've enjoyed our Saturdays where we find yard sales to peruse, or take a drive or go out to lunch, or whatever tickles our fancy. I often look forward to spending time with just the two of us. Not sure what else to put here, so I'll come back tomorrow to read some of the comments. Maybe something will spark an idea. Thanks for a fun post, I got a real kick out of this :-) I've not read your book Saturday Night Supper Club but have seen many great reviews on it, thank you for the chance to win a copy! Aw, thanks Trixi! I appreciate your enthusiasm. I hope you enjoy the books! I can be a homebody too, mostly because I spend so much time in the car driving my kids that when the weekend comes, I want to veg out with Netflix and a book or bake things. But my husband is good at making random errands fun too. We may be the only people who actually enjoy grocery shopping, but I look forward to it, especially in the spring and summer... so much amazing produce! So great to have you here, Carla! Loved the post. It's so true! Authors are strange and needy people! I love that my family takes such good care of me, especially when I'm on deadline. They pick up a lot of the slack around here and remind me of all the things I put out of my head when I'm on deadline. Thanks, Erica! We're definitely lucky to have understanding families. My husband picks up the slack, but my kids always seem to appreciate everything I do when I'm NOT on deadline after they've had to fend for themselves for a while. Thanks, Narelle. I admit, I do get take-out a lot while on deadline but we're fortunate to have a number of very healthy, cooked-from-scratch fast casual places, so we survive. Cooking is my stress relief, though, so I try to make dinner from scratch as much as possible. I am printing this and posting it for my family. Perfect, Carla! :) I will admit to the breaking of every rule, no doubt to my detriment... but then a post like this reminds me to do better. Are you going to highlight the chocolate part? The most important piece, IMO. And thanks for the coffee. You even brought decaf! How thoughtful! I love your fun advice. As a teacher, minister's wife, and aspiring writer I crave the moments of solitude that I can find. Walking in the country is a great respite and does help me to write. I've found this with an occasional solo retreat to a family farm. There's another place I recently discovered that will put an author up in an individual cabin and provide you with 3 gourmet meals and endless chocolate and ice cream for an unworkshop solo retreat. The price is fairly reasonable at 129 per night. I'm not sure if I can name names but it's in Boyds Mill Pa if you want to research it. That sounds wonderful, Bettie! I wish CO to PA wasn't such a trek or I would check it out for sure. I've been saying I should do a high country AirBNB retreat for a while now...I should go through with it. Best of luck on your current projects! Doesn't that sound wonderful? I wonder how productive I would be if I just had a little cabin in the woods where I could hole up for a few days and write without any distractions at all. No phone. No internet. I've heard that Jerry Jenkins (at least I think it was him) used to do that to write. Oh, Bettie, that cabin retreat sounds lovely! Welcome to Seekerville, Carla! This post could ONLY have been written by someone who has been down in the author trenches themselves! Thank you for the reminders! Between working full-time and writing 2 books a year, I find I often neglect these "sunny side" rewards that enhance hard work (although I am pleased that I've taken a walk--or at least been out shoveling when snow warrants--every single day this past month and I did allow myself to watch a handful of Hallmark Christmas shows over the holidays!). why is it so hard to find time to be NICE to ourselves? Your books look DELIGHTFUL. I'll definitely have to check some of them out! I'm impressed that you manage a full time job and that publishing schedule. I did five books in three years and it almost killed me. That taught me this is a long-haul career and we do need to take care of ourselves if we want to continue writing well. Carla's books are awesome, Glynna. I never thought I'd enjoy fantasy, but her Song of Seare series is one of the most profund ever. I've read the series twice, wept my way through the last fourth of the last book, too. You must read them. I can't live happily without a cup of tea every day. Or sometimes, two. :-) Thanks for the giggle this morning. TEA! Earl Grey in a china cup is my go-to when I want to pamper myself or celebrate some small triumph. I almost always have a mug next to my keyboard when I write. Can you believe something so great is also an antioxidant? I'm mostly a coffee person, but I do enjoy tea occasionally. It seems to soothe and sit lighter on the tummy than coffee. The other day I'd been sick with a sinus cold and I brewed a cup of herbal tea ... oh, man, the name of the herb escapes me!!! :( ... but lightly sweetened, it was just what I needed. And I really like the fruit flavored teas. I'll be making a pot of Earl Grey as soon as my morning walk is done! 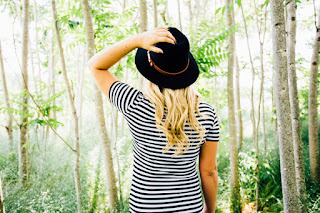 Carla, Such a fun post! I LOVE bubbles! Also a cuppa while reading is also a must! I brought chocolate chip scones to share! Yes! I agree! Definitely a cuppa or four. So glad you brought the scones... I made some chocolate chip scones on Wednesday and they're already gone! Carla, all of this is SO important. I'm not published yet, and I'm trying to develop the healthy habits now, before I have to deal with someone else's deadlines imposed on me. I like the one about plays, concerts etc. 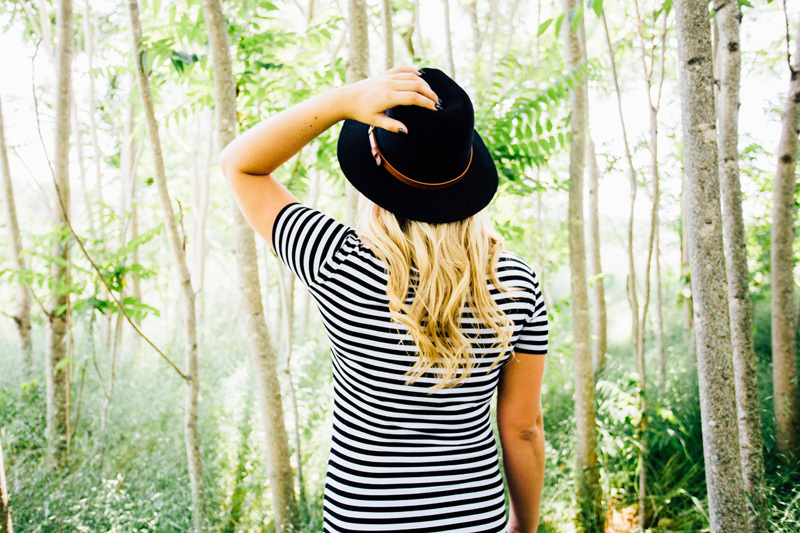 I'm a "Seven Habits" girl and the late Stephen Covey spoke often about "sharpening the saw." Experiencing someone else's creativity seems to fuel my own. I don't depend on anyone else to make this easy for me, it's my call and my choice. But I can see a time when I will need to ask for help, especially after I'm published. Fortunately it's just my husband and me, and he has always been extremely supportive. Don't forget to network with other writers, here and in person, and to go to conferences when time and money allow. You and your craft are worth it. Great advice, KB. Networking is so important. I love that we get to interact here online, but face to face is refreshing, isn't it? You are absolutely right! It's hard to overestimate the importance of connections, both business connections and fellow writers for support! I love these tips, but sometimes I totally ignore all five of them. Smh. You know what else I realized? As I re-read the topic headings on each of these, they are the exact same things I do for my toddler grand-daughter. I encourage a healthy diet even when she asks for candy, we take walks and hunker down and watch a BUG! (Ella's emphasis, not mine) slowly inch across our path, we play, I expose her to new things, and praise (we're potty-training) her when she accomplishes new things. 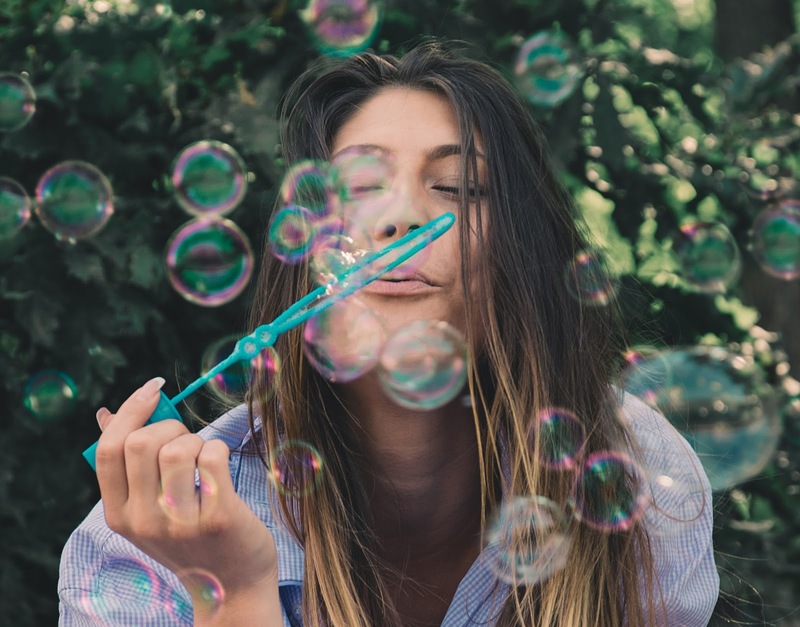 I'm not saying that authors are toddlers (but if the shoe fits... :) but isn't it interesting that the same basic principles for living a healthy adult life is the same for an adult as it is for a toddler? Ah, you're so sweet. It was fun hanging out with you for an evening. I suspect I do look younger than I actually am, but don't worry-- it's all an elaborate ruse of smoke and mirrors. Until my health made me slow down and take notice of how I was NOT caring for myself, I ignored them all too. I love being able to share here... hopefully it will save other writers the trouble I've been through! I enjoyed this post, but I find the care and feeding of a reader to be conversely the opposite of a writer. To start with that first tip, the feeding of a well balanced diet, why must people in this house need to eat dinner every. single. day? Don't they realize I have a book that I'm trying desperately to finish? That my heroine is about to be rescued and live that happy-ever-after life? There are cruel, cruel people who value all those fruits and veggies above my own personal happiness. And then there's tips two and three, to be active and play, what? Oh all right, I do occasionally straighten up, throw a load of laundry in the wash and hit my water aerobics class three times a week, but the whole time I'm doing these mundane things, I'm wondering where my characters (read come to life people) are at and what they are doing. Distractions I tell you, play and activity are nothing but reader distractions. Moving on to other inspirational art forms, I like good music, a good movie or performance as well as the next person, but honestly, every time I think I'll try one of these to break out of my reading addiction, I spy my comfy reading chair out of the corner of my eye, winking, yes winking at me and reminding me how much fun I have sitting there with a book and traveling the world, going back in time and even reading amazing contemporary books like The MacDonald Family Trilogy. (Might I mention you have caused me no small amount of reader anticipation angst with all the waiting for Under Scottish Stars, because a trilogy is not a trilogy until THREE books have been released). I guess that puts me squarely in that last little paragraph, you know, the one where the tips fail and chocolate is needed, because we readers are wild creatures too. I have to include you in my list of authors causing anticipation angst. I love Connor from The Promise of Breeze Hill so much, one of my favorites last year, but I have made room for Quinn on my list of swoon-worthy guys, and can't wait to get ahold of The Road to Magnolia Glen. All I can say is, is it June yet?! Oh, thank you, Tracey! :) I loved Connor, and I love the swoon-worthy hero that Quinn turned out to be. Ah, Tracey, you crack me up. I'd have to agree with you... real life can be a bummer when there are So. Many. Stories. Welcome to Seekerville, Carla, and thank you for starting my workday off with a chuckle. Yes, I'd me one of the difficult ones. I can just them tossing me a bag of carrots and me grumbling, "Me want CHOCOLATE!" To which they would either roll their eyes or run to the nearest convenience store, depending on intensity of my growl. Kidding aside, you make a valid point about how we authors can easily lose ourselves in our work, especially when we're on deadline, and neglect our wellbeing (and possibly that of those loved ones who reside with us). For me, I know that just getting up and doing something mundane like the dishes or laundry can spark some of my best ideas. However, forcing myself to step away from the computer to do said tasks can be difficult. Sometimes we're our own worst enemy. Thanks for the great reminders, Carla. Like, Ruthy, I may have to print this out and permanently affix it to the fridge. And I put FOUR Hershey's kisses and 2 Crabby Patties in a tin for her special treats later in the day. Once they're gone, hopefully she won't have a meltdown wanting candy. Out of sight, out of mind. Mindy, I get my best ideas while washing dishes or in the shower! Today, I'm loving the fact I get to take regular breaks on Seekerville at the end of each edited chapter. Yesterday, I pretty much sat in one place all day and worked... and totally forgot to take advantage of the fact my desk is adjustable! Pam, I can't keep candy, especially chocolate, around the house. Actually, just about anything sweet calls to me. I'm like Alice in Wonderland, except the food talks. "Eat me. Eat me!" And I'm not happy until it's gone. Sigh. Thus, if it's candy I like, it rarely makes it into the house. Longer comment did not post. Can somebody fix this? Never mind, I see it now. KB, I'm keeping an eye on spam today. I'm not sure WHY some comments end up in spam. Sometimes blogger is just weird! Carla, welcome to Seekerville and congratulations on your book! I try to walk 500 steps every two hours to keep my circulation moving. Sometimes I'm shocked to see how long I can sit working on my story. I'm also trying to figure out if I'm more productive getting up, showered and dressed like my other job. It's a theory I'm playing with. Any thoughts? But seriously, I agree - writing is a job, and we should treat it like one. So dressing in "work clothes" is a great idea. But there's no rule that says our work clothes can't be comfy! Thanks Jackie! I can't speak for everyone else, but I find a routine helps me a lot. I always get dressed in something that is not yoga pants or sweats and do my hair, though I rarely put on makeup (today I'm wearing powder and mascara-- just for you guys!) What helps me is the fact we have no bus service so I have to drop the kids off at school. That drive back home is like my commute. My agent tells me he has a client who will dress up in a suit, drive around the block, and then come home and work! Which I think is quirky but awesome. You're right. Quirky and awesome! But if that's what it takes to get in writing mode, I'm all for it. Welcome, Carla! Fun post! I am an avid reader and am so anxious to read your book due out Feb. I have heard soooo much about it. Please count me in the drawing. I just realized I have Five DIS on my Kindle and I DO plan to read it next! Oh, what a fun discovery! I love when I find things I don't remember downloading. Thanks for the the kind words and good luck! I've never shared a Seekerville post with my husband, but this one...he needs to read it! Thank you for much-needed entertainment. To keep me happy and productive, I must have a walk. Just a mile or so. Unfortunately, I hate cold weather. So if it's over forty degrees, I go out. If it's colder, I settle for Sudoku. I'm almost always unsuccessful, but it sends my mind in a totally different direction! Please add my name to the drawing. I'd love to have a copy of your new book! I think that's a great idea. Right now, it's pretty cold here too and it's been dreary, so I've had a hard time getting myself outside. During the summer I spend as much time possible in the fresh air. It's inspiring! Carla, I love this post! My husband and I have completely different jobs, work environments, deadlines, and ways to approach our tasks. Sometimes he tries to help me "get it," but then he always ends with - "but what you're doing seems to work for you." And he'll leave it at that. So I have to ask myself - does the way I approach my working life work for me? The bag of Ghiradelli chocolate chips on my desk? The timer that reminds me to get away from my computer every 30 minutes? My morning walk with the dogs? And especially, my evening reward of an hour or so of needlework after a long day at the computer? I have to say yes, it does work. Whether it drives hubby crazy or not, I'm going to keep doing it. I have to say, the bag of chocolate chips does seem like a good idea, but I'm not sure I trust my self-control. My reward is knitting. I'm finishing a pair of socks I started waaaay too long ago, but I've been having a hard time choosing between the stack of books that just arrived and the last half of this second sock! The 30-minute timer is a great idea! This is great! My daughter is a writer and although she isn’t published yet, I see her in this post. I am going to pass on all this wonderful information to her new husband. Thanks for sharing! That makes me smile... what a sweet mom. We're definitely interesting creatures and we marry brave men who love us for it! So glad you dropped by. Long time, no see, my friend! GO good to see you here in my old stomping grounds! You said: "Authors are strange creatures who rarely believe the praise of strangers but take their criticism directly to heart." OH. MY. GOODNESS!! God called me onto the carpet on this one BIG TIME!! Case in point. Even though my debut novel A Passion Most Pure has 892 5-star reviews on Amazon and almost 2200 5-stars on Goodreads, I was allowing the small percentage of 1-star reviewers to crush my confidence, steal my muse, and ruin my day. No, make that "week"! "Julie -- not only is your focus and belief in those 5-star reviewers a slap in the face to all those reviewers who took the time to post a good review, but it's a slap in My face as well because it's basically you believing satan over Me, trusting in Him for your confidence instead of in Me." That was a true turning point for me -- along with the sabbatical from traditional publishing that I took -- in understanding not only how faulty my thinking was, but how utterly irrelevant things like good reviews, good sales, and contest wins are in the face of God's plan for each of us as writers. So thank you, not only for writing an important post, but highlighting things all authors -- aspiring or otherwise -- really need to know. *FLYING HUGS* Julie! I've missed you! So glad to see you here. And thank you for sharing your wisdom! Yes, it's definitely one of the hardest things as an author and one of those things God has worked on me over the past nearly-five years of being a published author. And while I didn't mention it here, I took almost a year off from writing and considered making it longer, but God had other plans. It was the best thing I could have done because it reminded me that I was a person who writes sometimes, not a writer who persons sometimes. :) I had to person ALL THE TIME or else I was no good to my family or my readers. Talk about wake up call! Wow, Julie. Thanks for sharing those powerful words..."believing satan over Me." That's it exactly. Thank you for your tips. I can so relate. Since I am single and it is just me I can tend to be so focused on what I'm doing that I will forget to eat or do anything but the task at hand. I do see that I get out of the house for fun things so that I am not just wrapped up in what I am writing. Please enter me for a copy of your book. That's definitely both the benefit and drawback to a lot of alone time. When my family is gone, I tend to get pretty focused if I'm not careful. Thanks for dropping by! 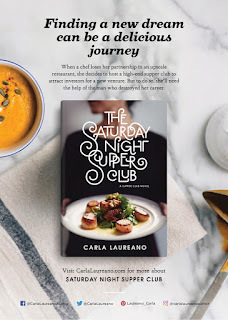 In my earlier ramblings I neglected to say how much I'm looking forward to The Saturday Night Supper Club! because it's a CARLA, and a foodie book, and you write great love stories, yes all these things, so please include me in the drawing. btw-will there be any more books in the Jilted line? that was great! Everything in moderation, I say! There's really no contest how much better you feel eating clean, but I'm not willing to give up chocolate completely... that's just crazy talk! Okay. You talked me into it. I'm allowed a little chocolate! I love to read when I eat but at supper I have to talk to my husband. :) Of course, he knows I keep my head in a book every chance I get. One goes with me everywhere. Sometimes I make him listen to me read. He enjoys hearing me read the Miss Julia books by Ann B. Ross. The author is a friend. I love cherry Twizzlers. And I love licorice, too, but recently read it was bad for you. The read thing, that is, not just flavored. Brilliant! And yet, keeping the waistline in check is a hard one when you have to get the wordcount in. You can throw chocolate at me anytime! Definitely a challenge every single one of us relate to, I'm sure! Yes, prayer is absolutely the most important component of balance. And fair trade organic chocolate. But mostly prayer. :D Thanks for your kind words, Phyllis! Loved this line in your blog: "...authors...rarely believe the praise of strangers but take their criticism directly to heart." So true. We are a strange breed! Your SAT Night Supper Club looks inviting. Thanks for being with us! Heading back to my WIP...I'm killing the villain, which is always exciting! Fun post, Carla. Started my writing dream late in life and my dearest husband did all the cooking (he'd been doing it for awhile---that's another story. LOL) He was the BEST encourager of dreams. I miss that in my life! Now, I have to grow-up and take responsibility for myself...making sure I eat correctly and take walks and have fun. The last is the hardest. The kids and grands are such a big help. I'm a tea-lover--strong black tea for me! Thanks for sharing and encouraging. Have a tea-riffic weekend. Kathryn, that is so sweet that he loved to cook and was such an encourager. Sounds like he was a keeper! But, lady, you're strong and you've got those kids and grandkids to hug. And if I was close by, we go on walks together! LOL, so fun, Carla! Welcome! And thanks for the great post. My care and feeding requires someone to drag me away from the computer, to make me live my real life. We have to remember that our loved ones come first. I've been eating salads for lunch lately and I feel great! Amazing the difference it makes, isn't it? I used to work in a setting where we had to take our own lunch and I found that one of the best and meals I could have for lunch was tuna and an apple. It usually kept me from having the afternoon slump. Fun post, Carla. For me chocolate is always a go-to. I also find taking a walk to be helpful for engaging my mind. Please enter me in the drawing. Your book looks good! Thanks, Sandy! Clearly I'm a chocolate fan myself, though I eat so little I'm getting picky about the "good stuff." Good luck in the drawing! Thanks for dropping by Laura! Glad you enjoyed it! Such a fun post Carla! Can't think of anything much better than chocolate. I'm with you, Connie! Thanks for stopping in! I apologize for the late visit. Blogger hasn't been awake for me in the early morning hours. Welcome, Carla! Cranky doesn't begin to describe my mood when I don't take time out and play. Thanks for the great post today! Carla, thank you so much for hanging out with us today. It was great to have you in Seekerville. Villagers, feel free to continue to comment on this post and make sure to check the Weekend Edition (goes live at midnight EST) to see if you're a winner this week. Thanks for having me, Pam! This was fun! Thanks, Tara! Glad you could stop by. Awesome post, Carla! Instead of going out in the desert wind I walk around my dining room table several hundred times! I love my chair, especially when I'm engrossed in a good book! I also love a good cup of Earl Grey or Vanilla Chai. Never have been a coffee drinker. Enter me for the book, please, it looks good! Vanilla chai is wonderful, though I've gone totally decaf with my tea these days and I don't like the decaf chais quite as much. (All the writers here collectively gasped at the idea of writing without caffeine. lol) Good luck in the drawing! I try to always make room for leisure reading with enjoyment the only goal.